Prostate cancer is the second most common type of cancer in men, after skin cancer, with nearly 162,000 new cases of the disease projected to be diagnosed in 2017. Approximately one in seven men will be diagnosed with prostate cancer during his lifetime, with about 6 in 10 cases being diagnosed in men age 66 and older. The treatment for this disease, as is the case for most types of cancer, depends on the stage of the cancer, and ranges from active surveillance, hormone therapy, surgery, and different types of radiation (external beam, cyberknife, and proton beam) to high-intensity focused ultrasound (which kills cancer cells with heat), cryoablation (which kills cancer cells with cold), chemotherapy, and immunotherapy. Immunotherapy: There are several different immunotherapy treatments in various stages of clinical trials and the FDA approval process. 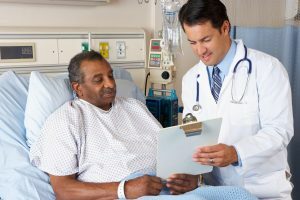 One treatment, sipuleucel-T (also known by its brand name, Provenge) has already been FDA approved for the treatment of advanced prostate cancer, but is currently being studied for use in men with locally advanced cancer. The treatment is a vaccine that is made for each patient, using the patient’s own white blood cells. The cells are sent to a lab and exposed to a protein from prostate cancer cells called prostatic acid phosphatase (PAP), then given to the patient by infusion. The vaccine activates T-cells, which attack cancer cells. Researchers are also working on developing prostate cancer drugs known as checkpoint inhibitors. There are already checkpoint inhibitors that are FDA approved for the treatment of melanoma, Hodgkin lymphoma, and bladder cancer. These drugs work by blocking the signals that cancer cells use to shut down the body’s immune response, so that immune cells remain active and able to kill cancer cells. Androgen receptor inhibitors: Another type of drug called androgen receptor inhibitors prevents the hormones known as androgens from connecting with androgen receptors, a process that can increase the growth of tumor cells. Enzalutemide (brand name Xtandi) has already been approved for treatment of advanced prostate cancer, but in a recently completed, successful trial in men with localized cancer, the drug delayed the development of metastatic cancer longer than anti-hormone treatments alone. FDA review of the study’s data is now underway. Vascular targeted photodynamic therapy: Still in clinical trials in Europe and at a few hospitals in the U.S., a new localized prostate cancer drug called Tookad is injected into the prostate and then activated by a certain wavelength of light. Once activated, the drug cuts off the blood supply to the surrounding tissue killing the tumor by cutting off its supply of oxygen. The potential benefit of this approach is that healthy tissue around the prostate is not effected as it would be by other treatments like some types of radiation and chemotherapy. If you’ve been diagnosed with prostate cancer, a health advisor can help you explore all appropriate treatment options and connect you with prostate cancer specialists and clinical trials so you have access to an experienced treatment team and the latest treatments and technologies.